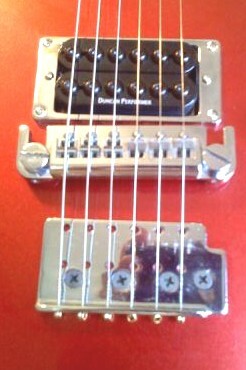 This is a short primer on the subject of how to fix the wrap around bridge on the base level Bronze series of the B.C. 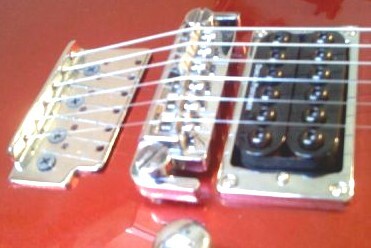 Rich electric guitars. As I see it, the problem is best explained by saying that the soft wood used in the bronze series simply isn't up to the job of supporting the lateral forces placed upon a wrap around bridge. I point the finger at the wood simple because I've not found a wrap around bridge equipped Platinum series or higher BC Rich which suffers from this chromic ailment, so I'm assuming that the better series benefit from firmer wood. 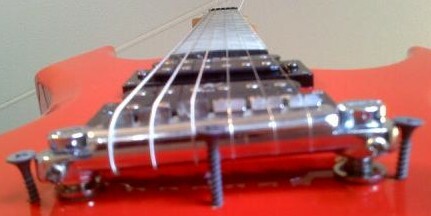 While no doubt the best fix is to take the guitar to a professional luthier who has the training and tools required to properly fix such a problem, like drill presses and wood glue and bridge post reinforcements, the total cost is such repair is likely to exceed the total market value of your entry level Bronze Series guitar. So I've come up with a couple of simpler fixes, one of which can be accomplished with no more than a few wood screws and an electric drill. 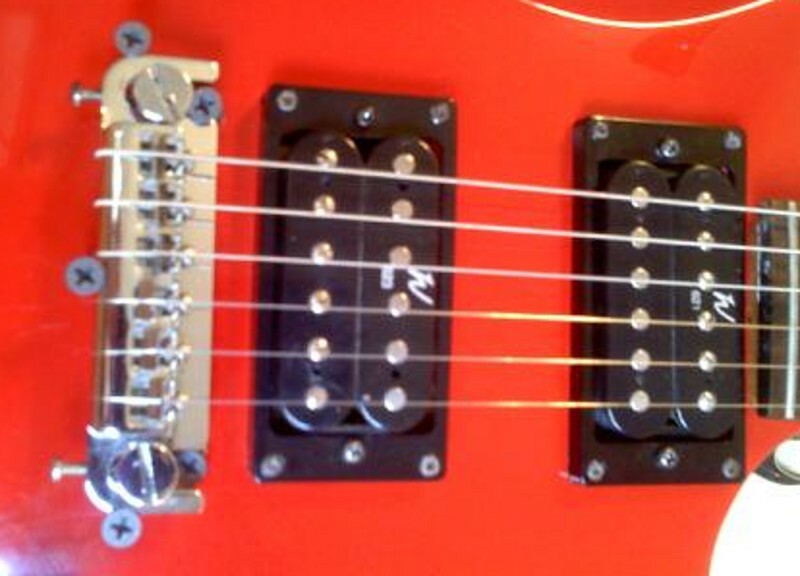 Before we proceed, understand that the wrap-around bridge design places lateral forces on the bridge which other non-tremolo bridges simply don't have to deal with. 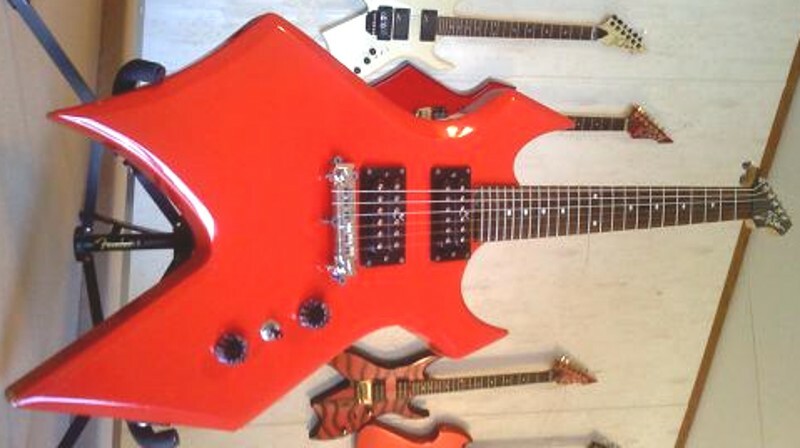 This is because the strings are usually routed on to another end point such as a stop tail piece or a trapeze tail piece or (in the case of a low profile bridge) on to grommets located in the other side of the body, as is the case in a string through body design. 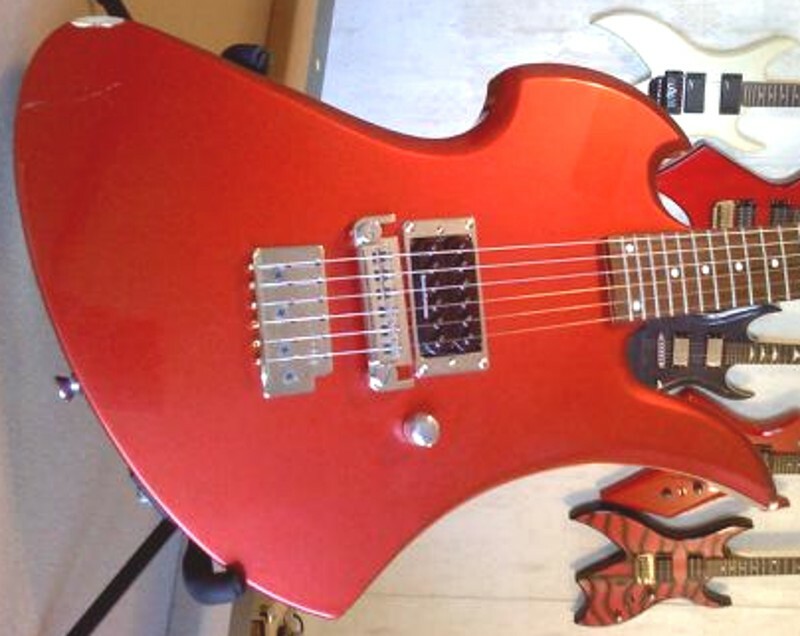 The first fix I applied was to my bronze series BC Rich Mockingbird electric guitar, and it's nothing more than installing some form of tail piece on the body of the guitar through which the strings can be routed and secured. So after removing the Mockingbird's strings, gently pushing the bridge to a more upright position, and then applying a drop of Elmer's glue to the front of each bridge post, I looked around the place and found a semi complete Memphis brand mini guitar, so I removed it's low profile bridge, removed the saddles, cleaned the bridge up, took some pains to insure that it's string holes were properly lined up with the guitar's bridge and nut, pre-drilled the holes for the wood screws, then used an electric drill to drive the screws down into the wood. 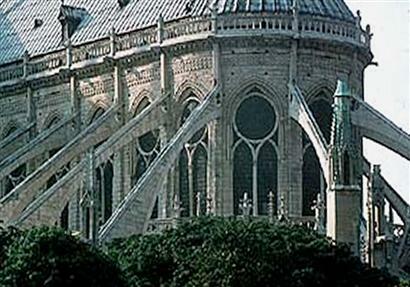 With most of the lateral forces removed from the wraparound bridge, the bridge stays upright, though I will inspect the bridge during each string change to insure that it's remaining fully upright. So with my beloved Bronze Series BC Rich Warlock, I simple studied how the supports should be positioned, pre-drilled the holes for the screws, then carefully screwed in the 5 wood screws by hand until the bridge was essentially locked in place. The front screws are under the bridge, and the side and rear screws are pulling down on the bridge. 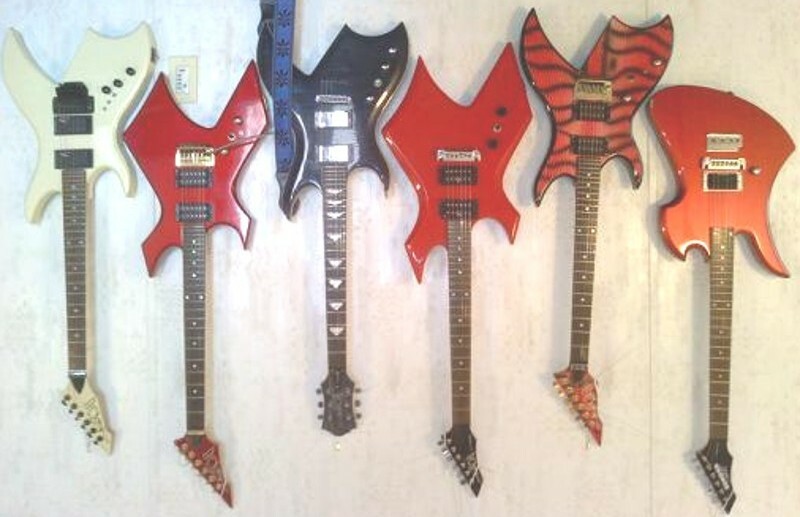 Click HERE to see what's left of my collection of incredible B.C Rich electric guitars.